Enjoy our customers’ favorite Wen® Cleansing Conditioner formula: Sweet Almond Mint. This universal formulation benefits all hair types and textures. Indulge your hair with this luxurious 5-in-1 hair care treatment that takes the place of your shampoo, conditioner, deep conditioner, detangler and leave-in conditioner. This moisture-rich, non-lathering product is designed to cleanse hair, reduce frizz, add shine and help maintain hair-color coverage without the use of harsh sulfates and chemicals. This lightweight styling product is designed to help tame flyaways, improve hair texture and give your locks more luster. This product is designed to take out the frizz while imparting hair with more moisture, shine and body. It also helps improve manageability and protect against the effects of heat-styling tools. With Wen® Nourishing Mousse, Chaz Dean has reinvented the outdated styling mousses of the 1980s. Instead of making hair feel sticky, dry or crunchy, this lightweight product is a treatment-based formula that’s designed to not only give you more volume with a lightweight hold but also to help nourish the hair whether you wear your hair curly or straight. Get gorgeous hair on the go with the Wen® Travel Kit, featuring essentials for silkier, stronger strands. For a little pampering time, indulge your hair with Wen® Re Moist Intensive Hair Treatment designed to leave hair looking and feeling softer and more manageable. For today’s order you’ll also receive your Free Gift and Free Shipping. 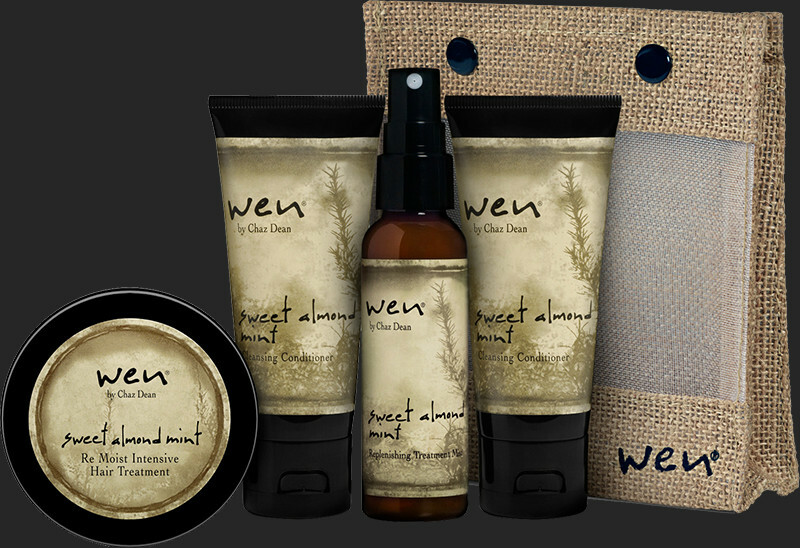 In about 7–10 business days you will receive your shipment of Wen®. Approximately 4 weeks after your first shipment, and then every 12 weeks thereafter, we’ll automatically ship a new supply of Wen® Hair Care and charge your credit card on file. 60-Day Money Back Guarantee means you can return your Wen® Hair Care Kit for a full refund (less s&h) within 60 days. Read reviews from real customers about Wen® Hair Care. Copyright © 2003 – 2015 Guthy-Renker®, All rights reserved. Guthy-Renker LLC is not responsible for pricing or other errors.